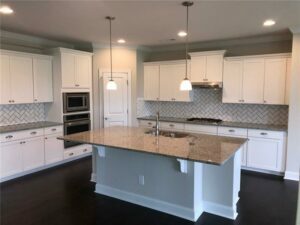 If you are looking for a new home in Atlanta, this is the perfect to weekend to visit Vanderbilt Homes’ premier community in Hall County, The Springs at Sterling on the Lake™! Today, Vanderbilt Homes is pleased to feature this move-in ready home available for purchase now at The Springs! Located at 7071 Boathouse Way, this 3 bedroom, 2 bath home offers the beautiful Kensington home design. The open-concept layout on the main level features a spacious family room with gorgeous fireplace that flows into the gourmet kitchen with large granite island, white cabinets, and mosaic backsplash. 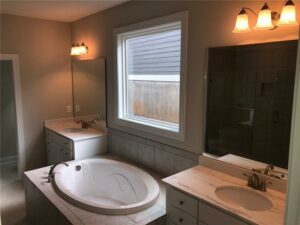 Enjoy main-level living at its finest, with a luxurious master-on-main and a spa-like bath with double vanities, tiled shower, and separate tub. The covered patio and screened-in courtyard are the perfect spots to enjoy your morning coffee or an evening glass of wine. 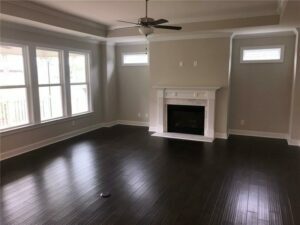 Hardwood floors extend through the main living areas! This fantastic home is priced at $414,207. The Springs at Sterling on the Lake™ offers the conveniences of main level living with all the luxuries of a modern home! 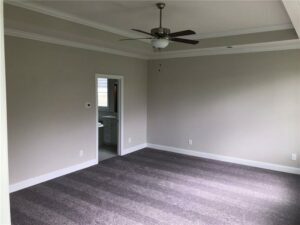 Choose from four fantastic home designs, including ranches on basements and master-on-main designs, with 2 to 3 bedrooms and up to 3.5 baths. Each well-appointed home includes hardwood floors, gourmet kitchens, gracious front porches, and custom features throughout. Directions: From I-985, take Exit 12 and go east on Spout Springs Road for two miles to the Sterling on the Lake community entry. From Lake Sterling Blvd, take the first left on Blue Heron Way. Sterling on the Lake™ is a premier planned residential community located in Flowery Branch, Ga., approximately 50 miles from downtown Atlanta. The community is situated on nearly 1,000 acres with over 200 acres of open space, lakes and parks. Designed as a true lakeside village, Sterling provides a variety of affordable and luxury homes with extensive community amenities including tennis courts, two clubhouses, pools, fitness center, private movie theater, boating and extensive walking trails. When complete, the community will have approximately 2,000 homes and over 6,000 residents. Home prices range from the $200’s – $700’s. For more information, visit www.sterlingonthelake.com or call (770) 967-9777. Escape the Noise, Escape the Hustle, and Escape Home with Vanderbilt Homes! Vanderbilt Homes builds new homes at Sterling on the Lake™, a premier community just north of Atlanta in charming Flowery Branch. Each Vanderbilt home is Designed for Living and Built for Life, and features the latest home designs and custom features that buyers want most. For more information on Vanderbilt Homes at Sterling on the Lake™, including available homes, photos, floorplans, and more, visit us online. To keep up-to-date on the latest news and offerings by Vanderbilt Homes, check us out on Facebook.